The Vernasca Silver Flag is a Dynamic Conservation and Restoration Concours for racing cars: cars parading on the street closed to traffic at restricted speed. The cars are awarded best preserved or restored. 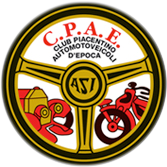 They accept racing cars built by the beginning of the century until 1972 with documented racing history in their time. The Organizing Committee may also provide to accept cars built after that year but only with great value in historic racing history.